Cavium unveiled its OCTEON TX family, a line of 64-bit ARM based SOCs for control plane and data plane applications in networking, security, and storage. The OCTEON TX combines Cavium's data plane architecture with its optimized ARMv8.1 cores (the company continues to produce its OCTEON III processors, which are based on MIPS). The new processors expand the addressability of Cavium’s embedded products into control plane application areas within enterprise, service provider, data center networking and storage that need support of extensive software ecosystem and virtualization features. This product line is also optimized to run multiple concurrent data and control planes simultaneously for security and router appliances, NFV and SDN infrastructure, service provider CPE, wireless transport, NAS, storage controllers, IOT gateways, printer and industrial applications. Cavium said the control planes of next gen platforms will need to run commercial software distributions and operating systems (e.g., RHEL, Canonical and Java SE), support open source applications (e.g., OpenStack, OpenFlow and Quagga), launch services dynamically and run customer specific services. Multiple types of high performance data plane applications also need to be supported for firewall, content delivery, routing, and traffic management. 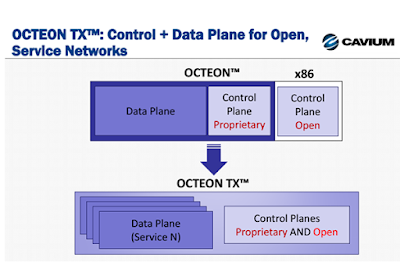 While current OCTEON SOCs are used in applications for data plane as well as control plane with embedded software, control plane applications requiring wider software ecosystem and support traditionally have been addressed by the x86 architecture. The ARM architecture is able to service these critical needs. CN80XX, CN81XX: From 1 to 4 cores, up to 2MB of Last Level Cache, 1x32b/64b DDR4 with ECC. Sampling in Q2. CN82XX, CN83XX: From 8 to 24 cores, up to 8MB of Last Level Cache, up to 2x64b DDR4 with ECC. Sampling in Q3.